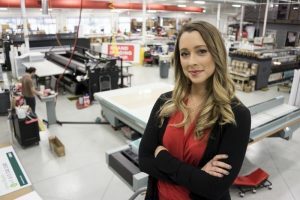 A native of Ferdinand, Indiana, near the famous town of Santa Claus and Holiday World theme park, Hillary Cremeens made her way to Nashville in 2008 to begin college at Lipscomb University. At Lipscomb, Hillary studied music with an emphasis in vocal performance and marketing. As many Nashville college students do, Hillary decided to stay in Music City after graduation in 2013. That’s where Big Visual Group entered the scene for Hillary. In fact, it’s really special for Hillary to be August’s Meet the Team feature, since August marks her four-year anniversary with Big Visual Group. Hillary says, “I interviewed here on a Wednesday and started work the following Monday,” which speaks highly to Hillary’s interview performance. Hillary learned about our company from a friend who knew a Big Visual Group sales representative, Andie Applegate. Andie was in need of a receptionist at the time, and Hillary decided to apply. Though Hillary began as a receptionist, she quickly excelled into a sales assistant role only six months after joining the Big Visual Group team. “That’s when I really started working with Andie. Since Andie was the office manager, I started learning right off the bat and got real, hands-on experience,” she adds. Hillary’s daily schedule can be a bit crazy and can take a different turn with just one phone call, but she loves the challenge and especially enjoys getting to go on client field trips where she can put a name with a face. Hillary also enjoys seeing a client’s workspace, which allows her to really invest more in the client. Her favorite accounts are projects where she gets to utilize all types of products that involve a bigger picture with multiple levels of project needs. Hillary was attracted to Big Visual Group because of the work culture and the solid reputation she had learned about the team members. Hillary says, “I had no idea about anything in the print and signage world, but I saw the potential here. Environment is huge for me, and the fact that I now love everybody who works here is a large part of what has kept me here the past four years.” Hillary believes Big Visual Group is a special place because of “the combination between everything we can offer and the fact that team members truly care.” Hillary affirms that everyone cares about what they’re sending out and that if something goes wrong, everyone comes together to make it right in the end. When Hillary is not on the job, you’ll find her putting her musical skills to the test. “I do a lot of wedding music,” she says. “I also perform at festivals back home,” adds Hillary. She and her two brothers were even in a rock band called C3 for eight years! Hillary also has hopes of putting together a Big Visual Group band, since there are so many musicians throughout the company. Hillary herself plays guitar, saxophone, violin, and piano. We think she could really be a one-woman band! In addition to music, Hillary loves fitness. She played softball with Nashville Softball League for three years, and she loves to run and enjoys outdoor sporting activities such as kayaking and hiking. Hillary is a woman of many talents, and we’re proud to have her on the Big Visual Group team.